Father Thomas J. Murphy, a retired priest of the Archdiocese of Indianapolis, died on Feb. 28 at the St. Paul Hermitage in Beech Grove. He was 82. The Mass of Christian Burial will be celebrated at 11 a.m. on March 7 at Our Lady of Lourdes Church in Indianapolis. Bishop Christopher J. Coyne, vicar general, is the scheduled principal celebrant of the Mass. Father Joseph Moriarty, vice rector of Bishop Simon Bruté College Seminary in Indianapolis, is the scheduled homilist. Burial is to follow in a family plot at Holy Cross Cemetery in Indianapolis. Father Murphy was a prominent member of the Indianapolis community for decades before being ordained a priest in 1985 at age 53. He worked as an attorney, served in the Indiana General Assembly and was elected president of Serra International, a Catholic organization that promotes priestly and religious vocations. Indiana Attorney General Greg Zoeller was a longtime friend of Father Murphy. He appreciated how his friend applied his faith to his life in service to the people of Indiana while serving in the General Assembly. That faith later on, however, became more focused on the possibility of a call to the priesthood. Msgr. Joseph Schaedel, pastor of St. Luke the Evangelist Parish in Indianapolis, was about to be ordained a priest when Father Murphy became a seminarian in the early 1980s. Father Robert Sims was archdiocesan vocations director both at the time that Father Murphy was a lay leader in Serra International and when he discerned his call to the priesthood and entered into priestly formation. Part of that energy in his priestly life and ministry was applied to promoting Christian unity and interfaith dialogue in central and southern Indiana as the archdiocese’s ecumenical and interfaith officer. Father Murphy’s love for priestly ministry didn’t wane even when he was diagnosed with Parkinson’s disease. At the time of the 2005 death of Blessed John Paul II, who was affected by the degenerative nerve disorder, Father Murphy reflected on this connection that he had with the late pontiff. Father Murphy was also known for his love of music, playing the piano and organ and for playing tennis. George Maley, a member of St. Joan of Arc Parish in Indianapolis and a member of the Indianapolis Serra Club, first met Father Murphy in 1958. He appreciated his friend’s multifaceted personality. Zoeller found inspiration in Father Murphy over many years. The priest celebrated Zoeller’s nuptial Mass, baptized his children and shared meals periodically with him and his wife. Thomas J. Murphy was born on Jan. 24, 1932, in Indianapolis to Robert J. Murphy and Helen (O’Connell) Murphy. He was baptized on Feb. 7, 1932, at Our Lady of Lourdes Church in Indianapolis and confirmed on May 6, 1940, at Our Lady of Lourdes Church. After graduating from Cathedral High School in Indianapolis in 1950, he studied at the University of Notre Dame in northern Indiana and later served in the U.S. Army. 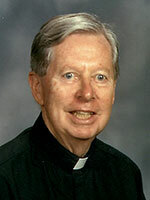 Father Murphy studied law at Indiana University School of Law in Indianapolis, graduating in 1961. He served one term from 1965-66 in the House of Representatives in the Indiana General Assembly, and ran unsuccessfully for Indiana Attorney General in 1968. He also taught business law at Marian University for 13 years and served on the school’s board of trustees. In 1970, Father Murphy became active in Serra International. He served as the president of the organization from 1978-79. Soon thereafter, Father Murphy discerned a call to the priesthood, became an archdiocesan seminarian and received priestly formation at the Pontifical North American College in Rome. Archbishop Edward T. O’Meara ordained Father Murphy a priest on Aug. 17, 1985, at Our Lady of Lourdes Church in Indianapolis. He celebrated a Mass of Thanksgiving at the same church on the following day. From 1985-87, Father Murphy served as associate pastor of St. Lawrence Parish in Indianapolis. He then served as pastor of St. Joan of Arc Parish from 1987-93. Also in 1987, he was appointed archdiocesan ecumenical and interfaith officer. In his last pastoral assignment, Father Murphy served as pastor of St. John the Evangelist Parish in Indianapolis from 1993 until his retirement in 2003. Surviving are his brother Robert O. Murphy of Granger, Ind., and several nieces and nephews.